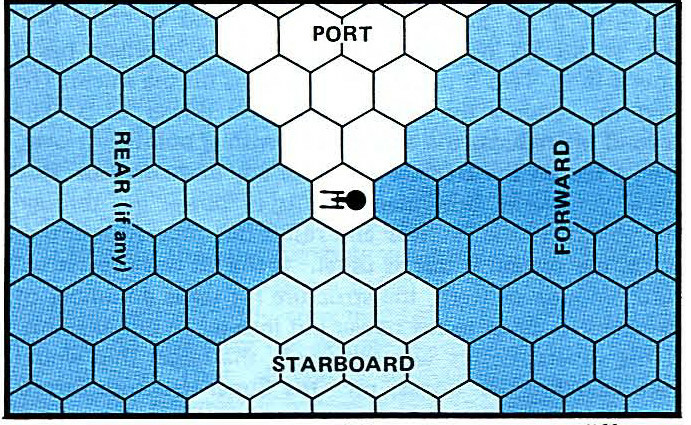 Obviously, the game as played is set up with four fire arcs, but as garhkal has mentioned more than once, he prefers to use the six-sided hex maps found in other tabletop games. Normally, it's not something I'd consider, but I'd like to hear if anyone else does something similar, and what are the pros and cons. The ones to the right and left of those are rear/left or rear/right. The one directly to the rear is just rear. I borrow from FASA's Star Trek. That looks decent.. I might have to adapt to that! I think it would almost make more sense to not have Front or Back arcs, but instead left forward, left, left back/right forward, right, right back arcs. It matches with captial ships doing the classic sailing ship broadside, IMO. I also think, if you're going to switch up the arcs, shields should be able to cover two adjacent arcs... so you could be left/right front, or left front/middle, but not left front/right rear. It would also match with "Put your deflectors on; double front", but that's just bonus. But this isn't the age of sail, and there are a lot of ships with fixed-forward armament, particularly starfighters. Having purely front or rear fire arcs coincides with this. In fact, the "Deadly Cone" described in the Rebel Alliance Sourcebook corresponds exactly with a 60-degree Rear Arc. In retrospect, there are a lot of reasons for a Base 6 number generator like D6 to use a hex map. For one thing, it's a lot easier to calculate scatter on a 6-sided pattern when using a 6-sided D.
...duh. Yup. That makes sense. Nevermind. The only question I have concern targeting a ship that is 90 degrees from the front or rear fire arc. Almost seems like you'd need to go octagonal, rather than hexagonal. Having said that, since the line dividing the two left arcs (or right arcs) is geometrically one dimensional, you could just flip a coin (roll a die) to determine which arc gets to fire at a ship that is approaching at a perpendicular angle. It is growing on me, especially since the crossovers I'm doing from Renegade Legion and Battletech all use hex maps as well. Or just rule that existing Left and Right Arc weaponry can fire into both Arcs. 90 degrees off the front means side.. BROADSIDE! I think thats a good solution. If guns can fire into both ars, then what is the point of having 6 instead of 4? Mr.Nexx's idea bears consideration, I think.